I know we are supposed to.stick.to.Lego and not discuss other brands, but does that extend to accessories, utensils, weapons etc.? I would SO love to get my hands on some 17-18th century gunpowder Lego weapons. Matchlock musquets (not "muskets! ), Saker style cannon, wheel lock pistols. I have experience sculpting and building all these things for.military miniatures and toy soldiers (not the same thing). 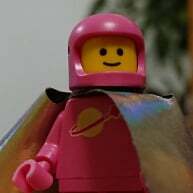 But anything I create for Lego use I can only gravity cast in resin. So while I can make basically anything I want for a static plastic miniature, they would be no good for Lego, unable to stand up to anything but display. I believe that Lego, by definition, is made to be played with! The main reason I got away from military.miniatures is my seven year old partner in crime. I love the versatility and infinite possibility of Lego! I'd pee myself for a wheel lock pistol design from one of the aftermarket Lego weapons/accessory companies. I can make items that look good, but are only fit for a shelf. I have my heart set on a decent 3D printer but the prices are still too dear. I bet those machines scare the seed pods off big toy companies! I can make items that look good, but are only fit for a shelf. I have my heart set on a decent 3D printer but the prices are still too dear. I bet those machines scare the seed pods off big toy companies! Doubt it, 3D design is not as easy as people seem to think and the plastic quality still has a long way to go. At best a 3D printer might compete with some model making kits, but even then I think the clever companies will move into selling designs etc. I have my heart set on a decent 3D printer but the prices are still too dear. I bet those machines scare the seed pods off big toy companies! In the same way that publishers have been scared by dot matrix printers in the 70s and 80s, then inkjet and laser in the 90s onwards, and various colour printers? 3D printing is unlikely to replace mass scale production. A bigger threat is kids playing online games rather than with actual toys. Don't the pirate weapons count as "classic" guns? I think @tedward gave you a possible or part solution. Brickarms makes a lot of weapons. Id say check them out. Plus there are a ton of people selling brick arms guns on eBay. Plus there are a ton of people selling brick arms guns on eBay. Oh good lord, don't use eBay to buy BrickArms. They have lots of legitimate sellers who ship all over the world at better prices than you are likely to get from eBay. I have dealt with Brickmania and G.I. Brick in the states and both are excellent. The only reason I can think to go to eBay is to get really expensive protoypes and convention specials. I simply DO NOT use evilbay. Ever. I am familiar with GI brick/brick arms, buy from them all the time!